Our bathroom renovation project continues, weekend-warrior style. After a very hard and busy week at work, Mr. SP worked himself silly on Saturday to complete the wall tile. I think it looks quite nice and am so impressed by the job that Mr. SP is doing. Here he is marking a tile to fit around a pipe. I’m glad he is doing it and not me. It’s hard to tell how many tiles I would waste trying to get one to fit. Mr. SP made a mock-up of a wall to test the grout color to make sure that we would like it. Unfortunately he had to work on Sunday, so there was no grouting time to be had. Next Saturday will be wall grouting day! I couldn’t exercise any last week because of my prolotherapy injections, so I had enough time in the evenings to complete the shower curtain. While I missed exercising, it was nice to come home after school and have time to work on a fun project. I also had time to cut pattern pieces for the window curtain in the main fabric and interlining. I am waiting on the coordinating fabric to ship from Fabric.com. It’s been a week! 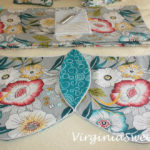 I’m also planning on making a roman shade using the coordinating fabric. 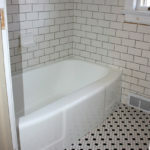 Next on the list will be to grout the walls and then have the plumber come back to finish the work with the tub faucets. 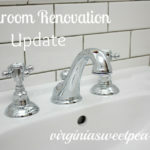 Our current debate is: do we do the floor and then have the tub resurfaced or resurface the tub and then do the floor? What do you think?? 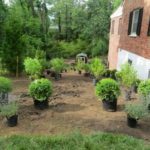 Giant Landscape Project :: Lots of Digging Ahead! Paula, I read this post earlier in the week and I’m sorry I never commented! Sorry that you were unable to exercise last week, but WOW! You’re doing great things with your time! 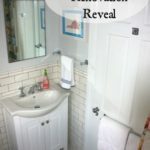 I just love your primary fabric, and I can’t wait to see your completed shower curtain and window treatment! I’ve never ordered fabric online–I’ll be interested to see how long it takes before you finally receive the order. 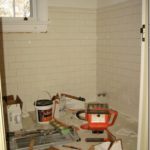 Your shower wall already looks beautiful, even without grout! Hats off to the weekend warrior! this is my first visit. 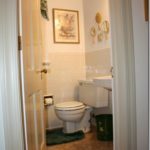 Your bathroom is looking wonderful. Love your subway tile, very nice. Your hubby did a fine job. I have never heard of glogging, they come up with something new every day it seems. 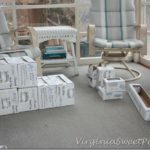 Oh and about the refinishing of the tub……I would do that first then do the floors, cause they just might mess up your floors. 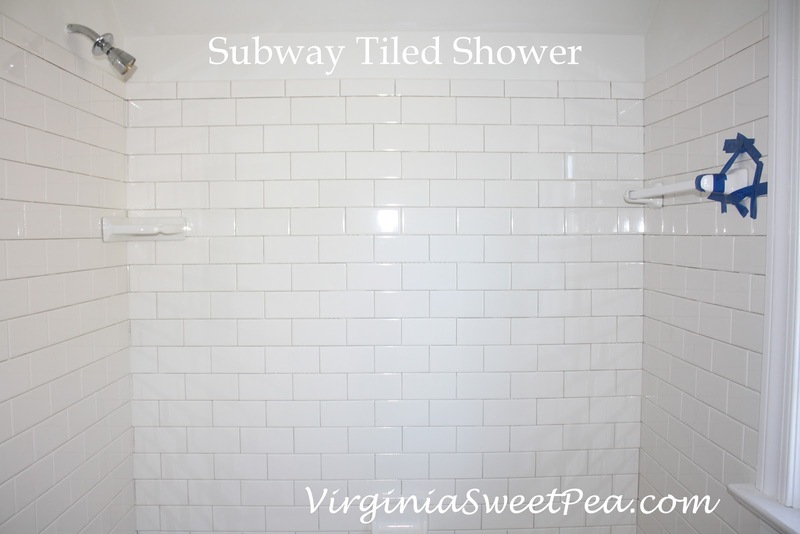 The bathroom tiling with the Subway Tiles looked great, even the grout. But, I must say that the fabric choice you made for the windows was great! I think it will really accent the rest of the room with those choice of colors.